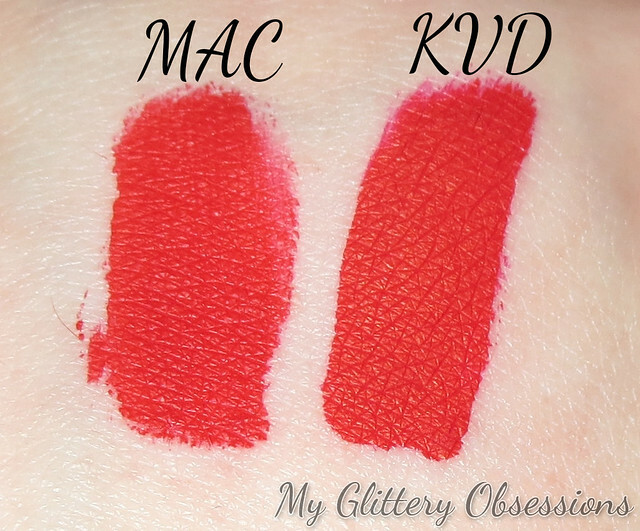 Basically, I somehow acquired a mini of Kat Von D EVerlasting Liquid Lipstick in Outlaw probably a year or two ago, and then a couple months ago, I bought a red from MAC's Retro Matte Liquid Lipstick range... and only once I got home did I realise... theres no difference between these two colours!! So, my plan is to tell you which I think is the superior product, so you need only buy the best of the two! The Kat Von D Everlasting Liquid Lipstick in Outlaw (above pictured in the mini size) — Size: 0.22 oz ; Price: $24 (CAD @ Sephora). The MAC Retro Matte Liquid Lipcolour in Feels So Grand — Size: 0.17 oz; Price $24 (CAD @ MAC). 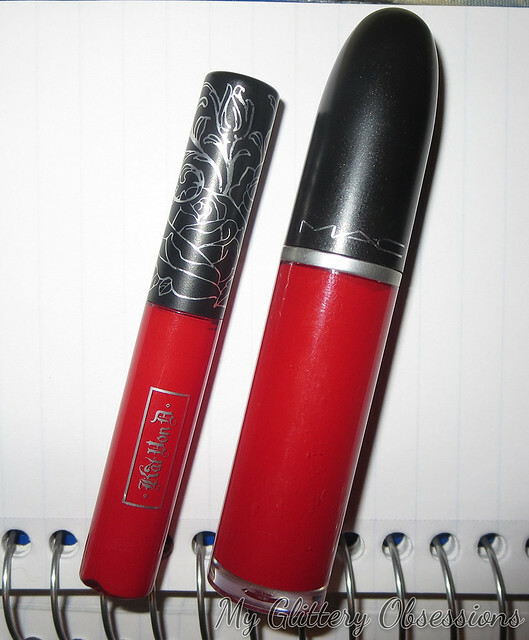 This formula has a very similar scent to other MAC lipsticks, though most vanilla, and less chocolate-y. I find this formula also applies evenly, but the wand does hold more product, so it can take more working to make sure the whole lip is even, and there isn't too much product on the lips. 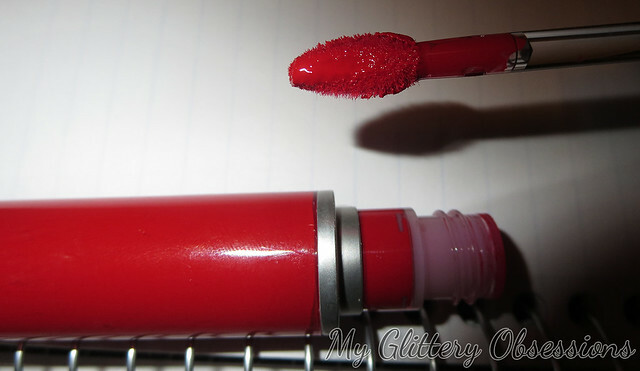 I also don't find this one dries as quickly, and it always remains a bit tacky, unlike the KVD, so if you can't stand anything sticky on your lips, this clearly isn't the one for you. Because it doesn't dry as much, it is also easier to transfer if touched, and just over all doesn't last quite as long without touch-ups. Don't get me wrong, I really like the MAC Retro Matte liquid lipsticks. You should see my review video if you haven't already if you want to hear more of my thoughts on that formula... 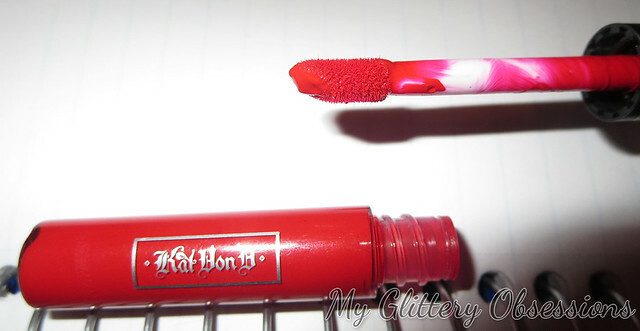 But for me, the Kat Von D Everlasting Liquid Lipstick formula is the clear winner in this battle! It's the same price, with more product, has an easier to use brush, dries completely, and lasts all day? What more could you possibly want? GRWM || Essence Cosmetics 1-Brand Makeup Look!